There is nothing like a big old truck. We love lifting up cars and trucks for our customers. We hate seeing the cheap lift kits that make the cars and trucks that we ride next to in traffic unsafe. We see customers who have replaced their CV axles 6 times or more because they lifted their trucks up the cheapest way that they could without really understanding their suspension geometry. We will examine your vehicle and recommend the suspension lift components that will give you the best ride and reliable service from your truck. 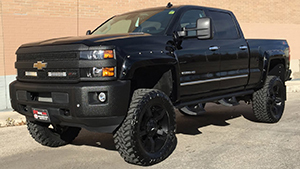 We have relationships with suspension component manufacturers and we can recommend the best products to make your truck safer for your family to ride in while still getting you the height that you are looking for. While you are lifting up your truck we can install the latest, coolest exhaust system to go with it.